Over many centuries, the craft of timber framing became known for bringing families and communities together to help and to celebrate the occasion. A person’s connection to the land was strong in those days as agriculture and manual labor were the order of the world. With the advent of modern technology, cranes and specialized tools replaced the need for large numbers of people to be present at a timber frame raising. But timber framing remains a way in which homeowners connect to nature, still celebrating and sharing a timeless bond with the craft and their land. 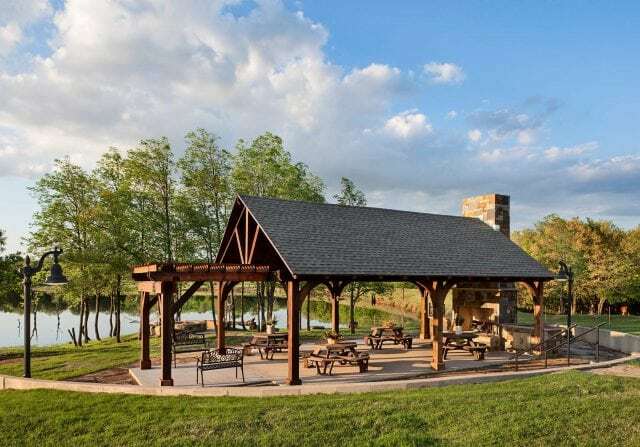 Because today’s homeowners embrace outdoor living rooms and other outdoor living areas like never before [i], Riverbend’s conceptual designs typically include stunningly designed outdoor spaces as part of each magnificent timber frame home. Additionally, many of these outdoor spaces serve more as extensions of the home, expanding the home’s square footage. This article offers items worth considering as you think about your future timber frame home and its outdoor spaces. 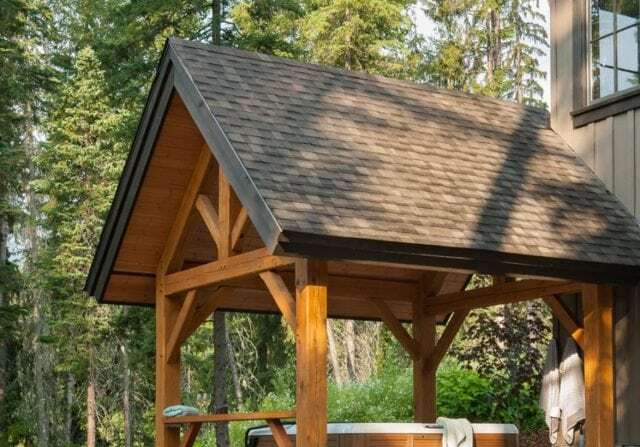 The location of your outdoor living space in correlation to your property and floor plan is an important consideration during the planning phase of your new timber frame home. Many Riverbend clients want outdoor spaces to serve as an architectural focal point of the home. If this sounds like you, consider designing a deck or patio directly across from your main living area. This makes your outdoor space a showcase. Locating deck or patio spaces adjacent to your great room, for example, seamlessly blends the indoors with the outdoors. The deck of the Kalamazoo Residence is located just off the great room and kitchen. For some homeowners, a more secluded location for a deck or patio is the epitome of paradise. If you too find a peaceful outdoor retreat more suited to your lifestyle, you may wish to consider building a private deck directly off your master suite. Another option is a standalone outdoor living room or outdoor kitchen, located farther from your residence. This separate outdoor space may be in addition to your private patio space or master deck that is directly accessible from the home. Every outdoor space requires careful planning when it comes to orientation to the sun. For example, if you enjoy your coffee while greeting the first rays of dawn, an east facing patio may be ideal. If you are not so inclined to mornings, or prefer to watch stunning sunsets, an outdoor space that faces west may be right up your alley. It is easy to understand how the design of outdoor spaces plays a pivotal role in the look of your timber frame home. Keep in mind, however, accessibility– especially in areas of extreme seasonal weather swings– is no less impacted by design. Below are three specific examples of design’s impact on accessibility. 1- The incorporation of specific architectural elements, such as deep eaves or extended roofs, assist in providing cooling shade during summer’s heat and protection from the shiver of winter. Depending on where your home is located, these design elements may allow you and your guests to access outdoor spaces during months where you once might have retreated indoors. 2- If a snow barrier is needed to facilitate access, your design can incorporate hardscaping. For example, an outdoor pony wall with a gate helps ensure you have access between your home and your custom firepit located just down the path. 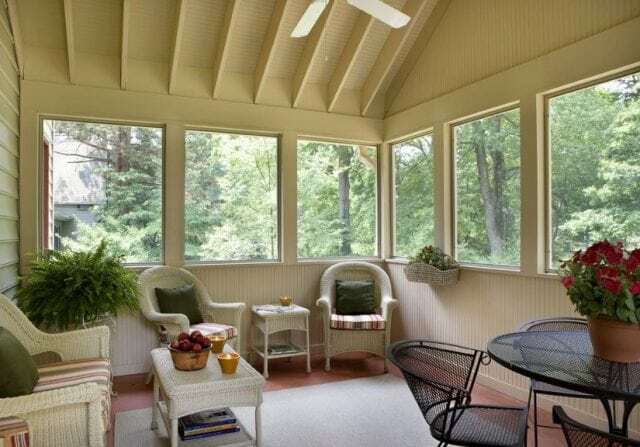 3- Enclosed screen or sun rooms, always popular in areas of high humidity, allow homeowners to enjoy nature’s delights without being subjected to pests or sticky summer heat. The addition of a sunroom, (or an outdoor living space), should not come as an afterthought when considering your design and budget. By speaking with your architect or ours, early on, you can save money and time. For a moment, let us assume that the design of your timber frame home is complete. You have approved the layout, reviewed your deck’s location and patio placement– and already picture your family sitting by a fire on a starry summer night. Sometimes special features like a custom fire pit or hot tub help make your outdoor space truly yours. Be it a sauna, hot tub, or one-of-a-kind fireplace, special features can enhance your lifestyle, increase the use of your outdoor living spaces, and help make memories that last a lifetime. There is very little to stand between you and enjoying nature from your outdoor spaces so long as you plan for it in advance. Most of your outdoor lifestyle needs can be achieved through deliberate location and orientation to the sun, thoughtful design, and a sprinkle of special features. 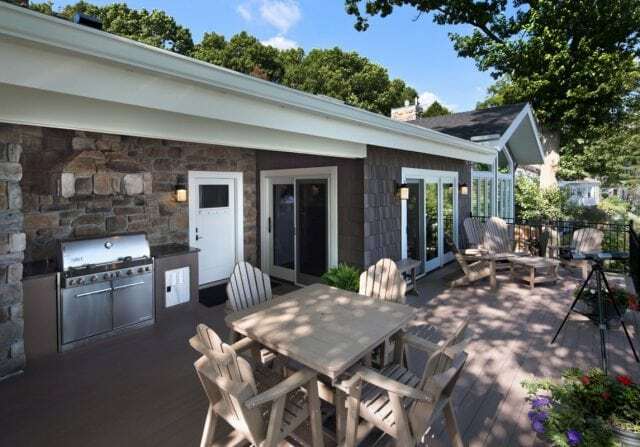 [i] The American Institute of Architects (AIA) 2017 second quarter Home Trends Design Survey reported requests for outdoor living had increased for the sixth consecutive year.